Before taking the microphone to speak to students and faculty at St. Mary’s Academy in Baldwinsville last April, Kelleigh Gustafson recalls panicking just a bit. At the time, Kelleigh, now a senior at Bishop Grimes Prep in East Syracuse, had never spoken to a crowd about arteriovenous malformation, the life-threatening vascular condition she was diagnosed with at age 4, or Kelleigh’s Cause, the organization she and her family founded to raise funds for research about the disease. She had preferred not to draw attention to her condition. Even her friends knew only “bits and pieces” of her story. The nerves lingered “just until I started speaking,” Kelleigh remembered. “Then it was fine.” Looking out over the crowd of elementary school students, she explained how her mother, Lori, had noticed a bruise on her temple when she was two days old and how doctors assured her mom it was just a type of birthmark that would eventually disappear. She shared that an MRI a few years later revealed a rare, dangerous and incurable condition called arteriovenous malformations (AVMs), which affected all of the blood vessels on the right side of her head, neck and chest. AVMs are the result of a birth defect that causes abnormal blood vessel growth. In typical anatomies, arteries and veins are connected by capillaries; together, they work to effectively circulate blood throughout the body. In AVMs, however, the capillaries are missing and blood rushes quickly through the delicate vessels. Complications from the condition include hemorrhage, seizure and congestive heart failure. In her speech, Kelleigh touched on some of the darker moments of her disease and how her faith helped her through. At age 7, she had a near-fatal reaction during a drug treatment trial. Just days after receiving Anointing of the Sick, she announced she had to “get better so I can receive Jesus” and was granted two hours’ leave from the intensive care unit in order to make her First Communion. She also talked about the difficult surgeries, performed every few months by interventional radiologist Dr. Patricia Burrows, that have kept her disease at bay. Though necessary, the surgeries carry risks of paralysis, blindness, stroke or even death. Following one such surgery in August 2012, Burrows told the Gustafsons that it was becoming increasingly difficult to treat Kelleigh’s condition. The family realized it was more important than ever to raise awareness of and find a cure for AVMs, not just for Kelleigh, but for all people affected by the disease. And so Kelleigh’s Cause was born. Kelleigh’s speech at St. Mary’s was delivered in advance of her organization’s first major fundraising initiative: a dress-down day held simultaneously in Catholic schools across the Diocese of Syracuse and Kelleigh’s native Diocese of Lansing, Mich. The idea — a day when a small donation “buys” a student the opportunity to wear casual clothes to school instead of the standard uniform — came from a group of Kelleigh’s friends, Lori Gustafson said. 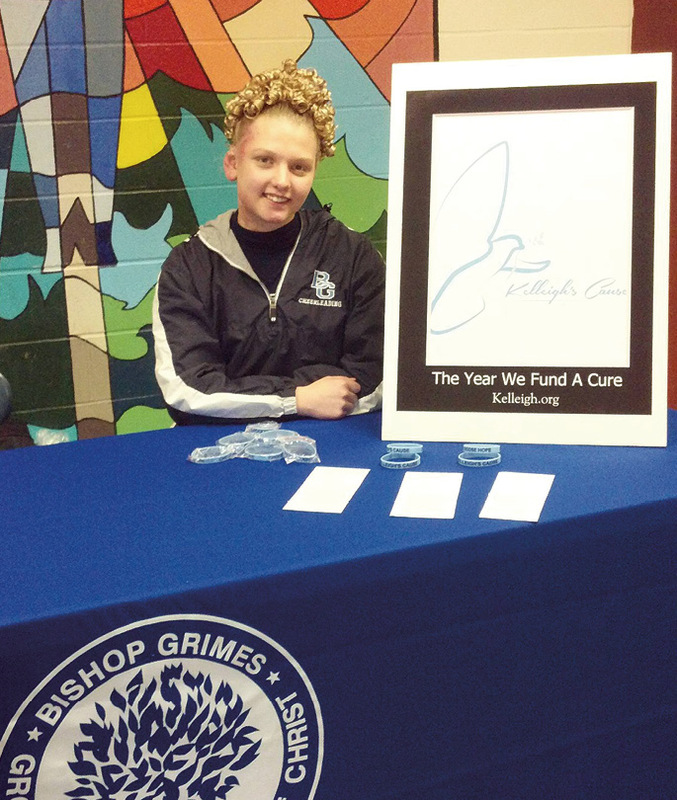 On April 19, 2013, a dozen schools from the Diocese of Syracuse participated in the dress-down day, as did 11 from Michigan, raising nearly $13,000 for Kelleigh’s Cause. 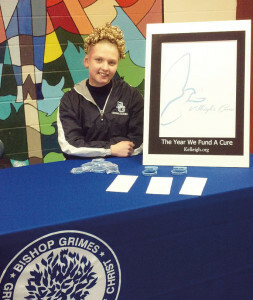 To date, Kelleigh’s Cause has raised nearly $50,000, the result of the dress-down day, generous donations, numerous fundraising events, a charity run in Lansing and a $500 gift from the Bishop Grimes Class of 2013. The Gustafsons are at work on a new round of fundraising activities for this school year and hope to repeat and expand on the success of the dress-down day. The initial goal, Kelleigh said, is to raise $150,000 for the Children’s Hospital of Wisconsin, where Burrows is part of a team pursuing research into a cure for AVMs. 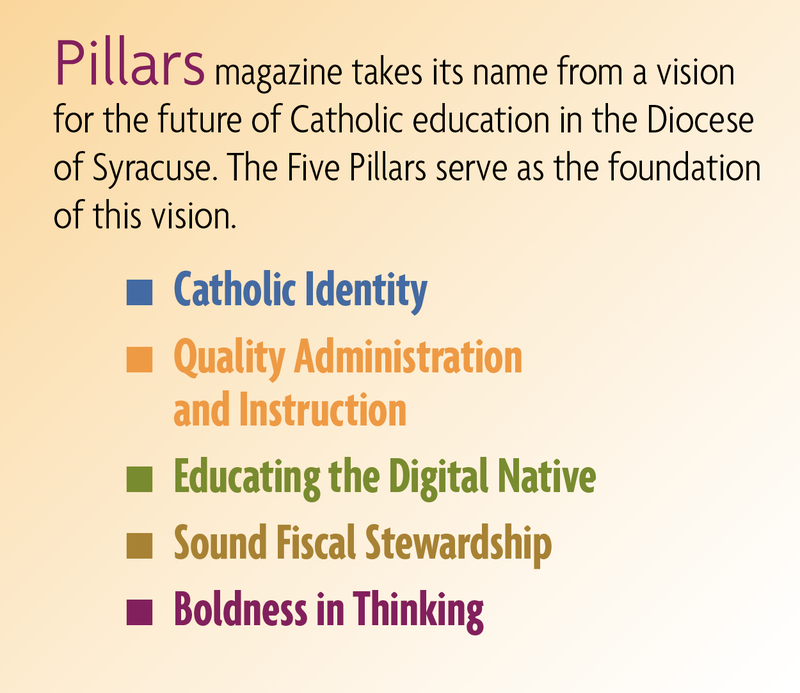 The long-term vision for the organization is to become “a very well-known cause and charity” in the nation and perhaps even the around the world. More than just raising money, however, Kelleigh’s Cause is about “sharing our faith and what this journey has taught us,” Lori Gustafson said. For more information about AVMs and Kelleigh’s Cause, visit www.kelleigh.org or “like” www.facebook.com/KelleighsCause. Katherine Long is the editor of The Catholic Sun. Portions of this article appeared in her story about Kelleigh’s Cause published in the April 4, 2013 issue of the Sun.